So where were we? 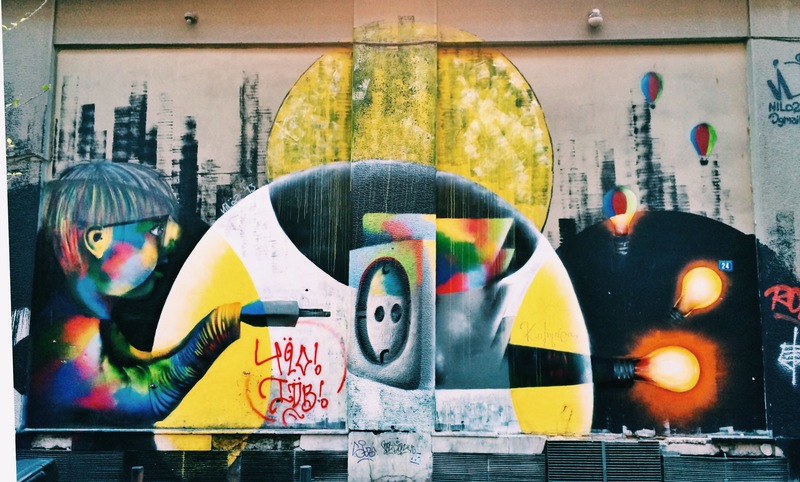 You were hanging out around the centre of Athens and it’s probably late afternoon – depending how many of the previous tips you followed (and how much time you spent at the Acropolis or the markets!). What next? Here it goes. Food-wise, feel free to tweak the suggested itinerary based on your pangs but try not to skip any of it for the full effect. If you’re into naps, Athenians won’t hold it against you. Go back to your hotel to change your clothes and make it comfortable enough for walking, dancing and possibly getting straight to your next destination with no sleep at all. On your way there, whether you’re coming from Plaka or the market, stop at Lukumades near Agias Eirinis square. 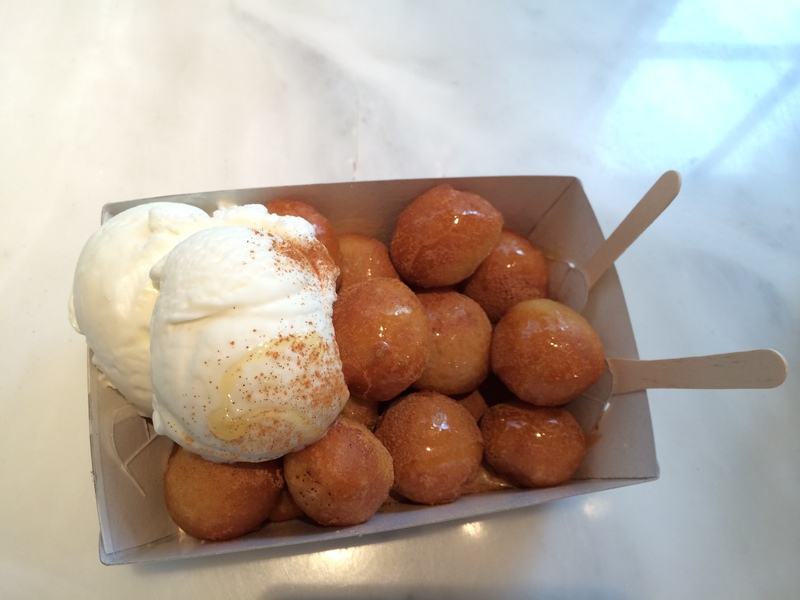 Heavenly Greek donuts in many variations: go classic with honey and/or kaimaki ice cream or melted chocolate if you don’t care much for tradition. If you didn’t feel like napping, stop at nearby TailorMade for a freddo espresso or cappuccino, the Greeks’ choice of coffee that’s especially rewarding on a warm summer’s day. They also have really good cocktails but you might want to start pacing yourself since the night should be long. If you’re into sit down meals, I promise to follow up with some suggestions in a future episode but for this sort of itinerary, I would recommend heading to Monastiraki for a good ole fashioned souvlaki. Staple of Greek street food: souvlaki. 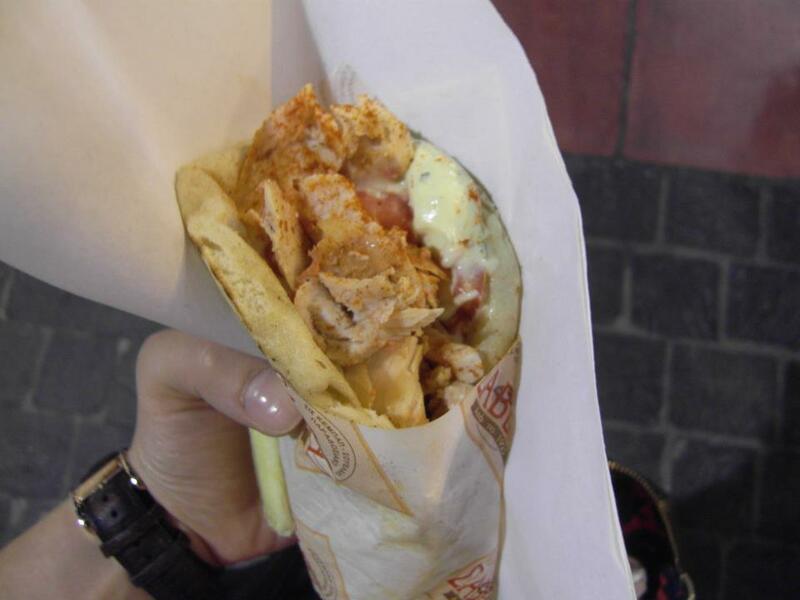 This particular version is chicken gyros with the works from Savvas at Monastiraki. Unless you’re a vegetarian, in which case you might also enjoy Falafellas, which I haven’t tried but have only heard good things about. If you’re checking these places out in Google Maps, you’ll notice that you don’t need to consider transportation to get around. That’s the beauty of the rejuvenated city centre of Athens. So many great places are a few minutes walk from each other and allow you to bar hop and experience plenty. 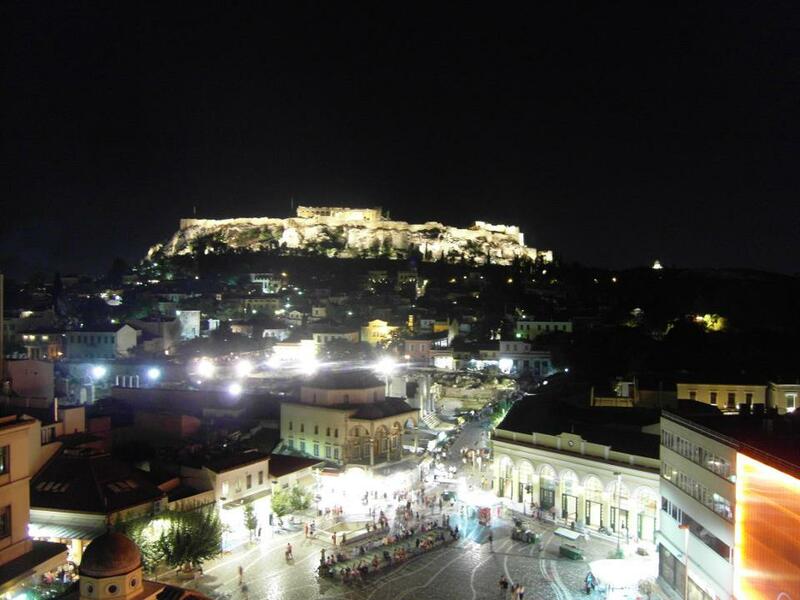 If you made it to Monastiraki and want to try your luck at A for Athens, a rooftop bar with Parthenon vistas, go for it. The cocktails are great and the vibe is good, the view is of course amazing. For those in a rush, taxis are extremely reasonable in Athens. You’ll find it hard to go over 10 euros for most trips around the city unless you’re stuck in traffic or on the motorway. Traffic is a problem though and especially on a Friday or Saturday evening, you should expect Athenians to be driving (and frantically looking for a parking spot) so if you don’t mind walking, take your time and stroll to the next stop on the list. On the way, you will pass by the main commercial street of Athens, Ermou, that is still packed with people in the evenings, checking out the shop windows and hanging out while on their way somewhere. Walk all the way to the top to get to Syntagma square, which you might be familiar with from the news. The Greek Parliament is staring at you and if you were to visit during the day, you could see the Presidential guard change and people feeding the nasty looking pigeons. 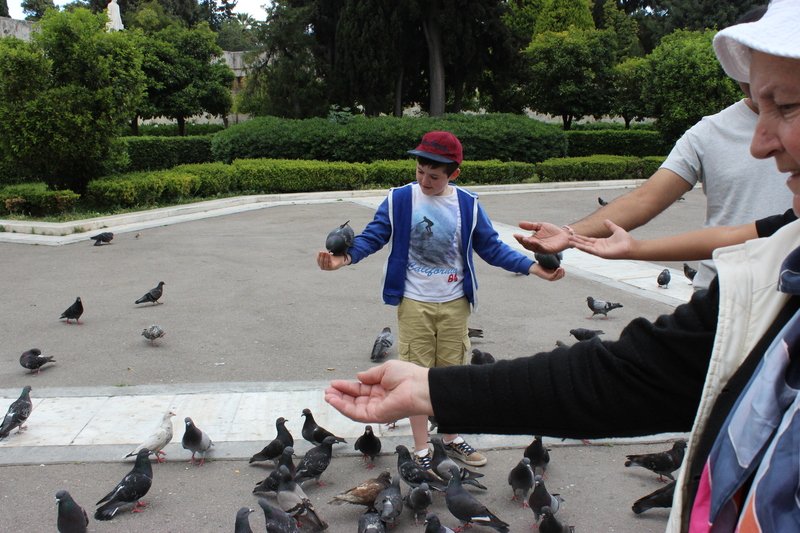 This boy proceeded to lie on the pavement, cover himself in seeds and get the birds to eat of him. It was as grim as it sounds. Did you think that was all of it? Ha! The night is always young in Athens so wait until part 3 and you’ll see what I mean! UPDATE: Chosen soundtrack for this post, Nyhterino (circa 2000), probably one of my favourite Greek songs ever, literally translates to ‘nocturne’.